by J Michael Waller / Serviam / December 30, 2008. After a successful if rather uneventful career as a U.S. Army artillery officer, Capt. Robert Parker Parrott went into the private sector. That’s where his real contribution to American national defense began. Thanks to his West Point education and his 12 years as a commissioned officer, Parrott amassed immense knowledge of artillery and ordnance. Finally, after being assigned as an inspector at an ordnance plant, Parrott quit the military at age 32 at the urging of the plant’s owner—and brought all his taxpayer-funded expertise to the private company. The young weapons expert would become a prominent inventor of improved artillery and projectiles, patenting his designs and selling his new weapons to the U.S. government. A cynic might denounce Parrott as a selfish, unpatriotic conniver, a war profiteer who unjustly gained personally from his military experience. But Robert Parrott was nothing of the sort. A strong but humble patriot, he put his country and the needs of the military first, even when he easily could have commanded any price he wanted for his inventions. Without the flexibility that the private sector gave him to experiment and innovate, he probably never would have invented and perfected the next generation of artillery systems. When the Civil War tore the nation apart, the Union victory would hinge partly on the soldier-turned-businessman. In 1824, at age 19, the New Hampshire native graduated near the top of his class at West Point and received his officer’s commission to become an instructor and professor at the academy. 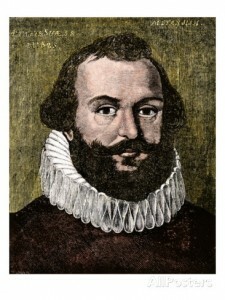 He was a strong mathematician and scientist. After serving at West Point and in other peacetime assignments, Parrott was assigned to the 3rd U.S. Artillery to serve in the war against the Creek Indians. 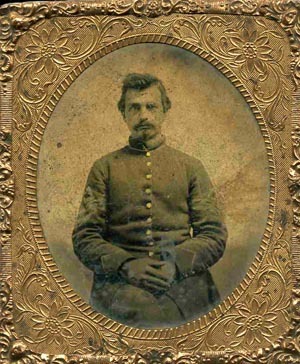 This experience marked his professional turning point: Ultimately, he became an assistant to the head of the Ordnance Bureau, and finally, an Army inspector at the West Point Foundry, a private firm in Cold Springs, N.Y., that manufactured civilian and military products of cast and wrought iron. The captain retired from the Army in 1836 after the iron works’ owner, Gouverneur Kemble, took a liking to him and convinced him to leave military service and join his enterprise to run its day-to-day operations. Within a few years, Parrott married Kemble’s sister Mary, leased the foundry from his new brother-in-law, and acquired 7,000 acres of forest as a supply of charcoal. He and his brother Peter bought their own pig iron furnace and ran other Kemble furnaces. Soon, he was devoting himself to the development of superior artillery systems. That freedom to experiment, free of government bureaucracy, combined with a strong sense of patriotism, allowed Parrott to invent and perfect a type of artillery that would prove crucial to the preservation of the United States when the Civil War broke out in 1861. Before the war, Parrott had spent more than a decade of painstaking work to build a more powerful and accurate artillery design capable of firing a more powerful piece of ordnance. Parrott unveiled the first of a line of rifled cannons, with a special projectile, that packed more destructive power, than most other guns at the time. His secret was a cast-iron cannon with a rifled bore, reinforced at the breech with a wrought-iron casing that permitted the firing of a much heavier charge. Cast-iron cannons could burst when firing large charges, with potentially catastrophic effects on the gun crews. Similar designs existed, but Parrott perfected a technological process to meld the cast-iron barrel with the wrought-iron reinforcing ring. Even so, the cast-iron breech would often fragment in combat, and Parrott and his guns had no shortage of critics who wanted nothing to do with the weapons. Parrott Guns as shown here can still be seen on the site of the First Bull Run in Manassas, Va., where they were used for the first time in combat. For Robert Parrott, expense was everything: He wanted to build simple, effective, low-cost weapons for the military. Unlike many entrepreneurs of the time, he did not want to overcharge. He wanted to serve. By the outbreak of the Civil War, graft, corruption, and gouging of the military were almost standard operating procedures. Parrott did not operate that way. He made a profit, but he deliberately kept his margin small so the government could buy more guns and win the war. Capt. Parrott’s cannons were specifically designed to protect gun crews from dangers typically associated with similar weaponry that were not sufficiently reinforced to withstand repeated heavy blasts. That would earn him no credit from his wartime critics— both those who accused him of being a gouger and fellow businessmen who said his weapons designs were so vital that the government would pay any price he wanted. The Parrott Guns advanced three basic principles: a rifled bore to spin a projectile more accurately, a reinforcing band of wrought iron around the cannons’ cast-iron breech to allow for a much more powerful explosive propellant charge, and a specially designed oblong exploding shell. They ranged in size from small, wheeled, horse-drawn field artillery pieces that fired a 10-pound projectile to immense, 26,000-pound cannons fixed on pivots in fortresses and earthworks that could send a 300-pound exploding projectile up to 9,000 yards. 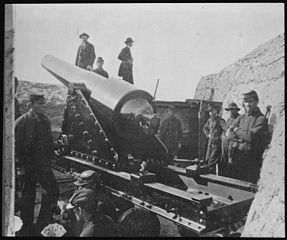 The War Department quickly embraced the new design and bought the Parrott Guns in large quantities, as field artillery pieces, large defensive cannons for fortifications of harbors and for the capital city of Washington, D.C., and aboard new steam-powered warships. The Parrott Guns made their combat debut at the First Battle of Bull Run (First Manassas) in July 1861. “At the first battle of Bull Run the guns called by his name hurled their unerring missiles at his country’s foes, and at every succeeding engagement, on land or water, during the continuance of the stupendous war, the ‘Parrott’ cannon thundered and the ‘Parrott’ shells flew, screaming on their destructive course, doing their steady duty in honorable representation of their inventor, who thus regretted that he was unable to be in the field to do it in person,” according to the inventor’s obituary at a West Point reunion. On a war footing, Parrott developed a series of rifled cannons based on his three-part principle, along with a revolutionary fuze and cannon sight. He worked feverishly to improve the weapon in a variety of sizes. The Parrott rifles were credited with making traditional stone fortresses obsolete, and were used with devastating success against the Confederates at Fort Macon, Ga., in April 1862. The weapons fired solid shot bolts for use as siege guns against fortresses, case rounds that exploded and sent showers of iron and lead fragments on personnel, and incendiary rounds. The foundry’s initials, WFP, were cast into the tube or muzzle of each Parrott Gun along with the designer’s initials, RPP. The Confederates soon copied Parrott’s design, producing knockoffs in some of the South’s few foundries. Parrott spent more than a decade of painstaking work building a more powerful and accurate artillery design capable of firing a more powerful piece of ordnance. His guns used a special projectile that packed more destructive power, fired more accurately and at longer distances than most other guns at the time. Parrott would not sell his military creations just for the sake of business. Patriotism motivated his entrepreneurship. This type of gap-filling—providing the government with products and services only when needed, and canceling the contracts when they had outlived their usefulness—would exemplify the characters of the best private military contractors. With the virtual self-cancellation of a hugely profitable contract, Parrott stepped back from operating the foundry and spent the rest of his days experimenting with projectiles and fuzes.